All Aboard The Syracuse Basketball Express, Next Stop National Championship! This Syracuse basketball train is here, this is your last chance to hop aboard before they take off for the NCAA tournament and beyond. Fasten your seatbelts, boys and girls, we’re in for an exciting – and likely nerve-wracking – stretch run of the SU basketball squad’s 2016-17 season. Left for dead a few weeks ago, the Orange clearly has regained its mojo, playing its best ball to date at exactly the right juncture. 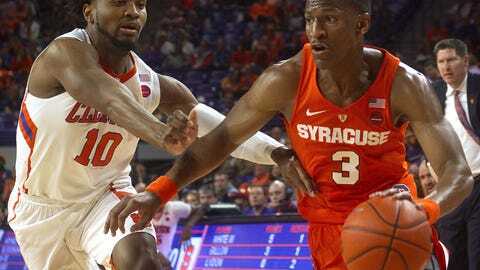 Freshman Tyus Battle, who struggled virtually the entire game, nailed a corner 3-pointer at the buzzer off a fantastic feed from sophomore Tyler Lydon to propel the ‘Cuse to a heart-stopping 82-81 triumph over Clemson in a terrific ACC clash at Littlejohn Coliseum. Syracuse (16-9, 8-4 in conference competition) extends its winning streak to five and picks up its second road victory of the year. Don’t look now, but the Orange, for the moment, sits alone in fourth place in the Atlantic Coast Conference standings. For the Tigers (13-10, 3-8), it’s yet another close defeat. Clemson, paced by senior Jaron Blossomgame’s 20 points, led for a large portion of the contest, including by as much as 12 in the first half and nine after intermission. Honestly, the outcome really came down to which program had the final possession. Lucky us. Each school connected on 29 field goals and 14 free throws. The difference? SU drilled 10 from downtown, while the Tigers had nine. Syracuse had some awful setbacks. I always said that this team possessed tons of talent, but it lacked cohesion, grit and toughness. I take all of that back. The 2-3 defense is still pretty putrid in many instances, however, these guys are clawing and scrapping their way to wins. They won’t take no for an answer. The Orange has outlasted Wake Forest, then-No. 6 Florida State and then-No. 9 Virginia at home, as well as N.C. State and, on Tuesday night, Clemson away from the Carrier Dome. Against the Cavaliers, the Wolfpack and the Tigers, SU had to mount relatively massive comebacks to prevail. The Demon Deacons conquest proved a squeaker. Syracuse blew out the Seminoles in the initial stanza, then had to hold on for dear life. What I’m trying to get at here is that the ‘Cuse has turned the corner and shown some big-time heart. By no means is a NCAA Tournament bid a certainly, not by a long-shot. But, SU has put itself back into the Big Dance conversation. With six affairs remaining in the regular season, I firmly believe if Syracuse can secure a minimum of three additional victories, that will give them 11 ACC triumphs. Despite a horrible non-conference slate, that should prove sufficient for a NCAA Tournament invite. Regardless, you have to admire the fight in this bunch. They could have easily rolled over and waived the white flag. They didn’t. While fanatic fans like myself would prefer if our beloved Orange could emerge victorious in a game or two without having to erase a huge deficit along the way, a win is a win. I’m proud of this group. And, I think head coach Jim Boeheim is, too. He has gotten frustrated with his roster on numerous occasions, that’s no secret. Yet this Syracuse squad’s desire, and will, have become a sight to see. First of all, that’s horrendous grammar, even for a tweet. Secondly, Gottlieb can kiss my … Orange. No matter what happens here on out, at the very least, SU has made the 2016-17 campaign interesting. I love how Boeheim raised his arms up in the air to celebrate Battle’s buzzer-beater. He wants this team to succeed. He hopes – we all hope – that entails a March Madness inclusion. Boeheim notched his 1,001 career victory down in Clemson, S.C. Or, according to the NCAA, he got his 900th win. For a second time. Weird, right? However you slice it, the Orange is on a sweet run. Up next is a rematch with conference dweller Pittsburgh on Saturday, Feb. 11. Despite a lackluster record, the Panthers always play SU hard on their home turf. A daunting challenge for sure, but one that I’m confident Syracuse is ready to confront.